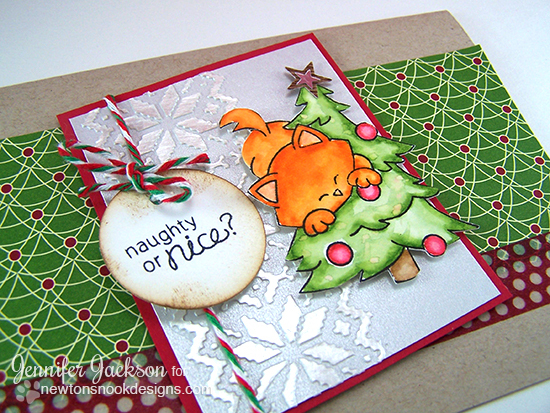 Welcome to our Deck the Halls with Inky Paws Blog Hop!! 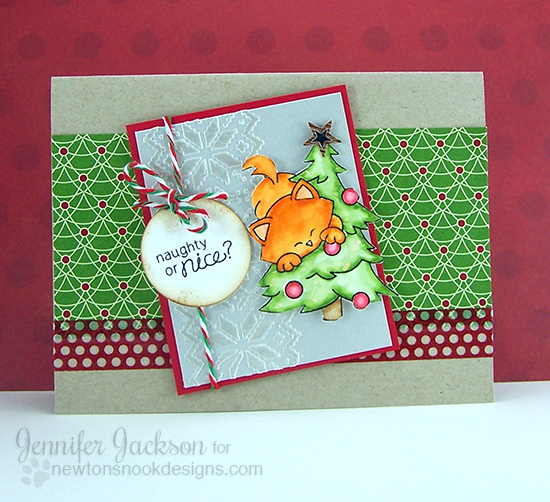 The blog hop starts here, with a card featuring Newton's Curious Christmas! Since our kitty Newton is both naughty and nice - I thought I'd color this kitty to be orange like him. I love this image of the kitty in the tree - it looks like he could either be decorating the tree or being naughty and knocking down the ornaments! I stamped the image onto watercolor paper and colored it with distress markers and a water brush. Behind the kitty image is small chunk of silver paper that I added some fun texture too using some embossing paste and a sweater pattern stencil. Then I framed it in red cardstock to help the whole thing pop. The "naughty or nice" sentiment is also from the Newton's Curious Christmas stamp set and was added on with some holiday bakers twine. Then for the base I used a scrap of red and green patterned paper from my stash and some red polka dot washi tape! I love how this turned out! 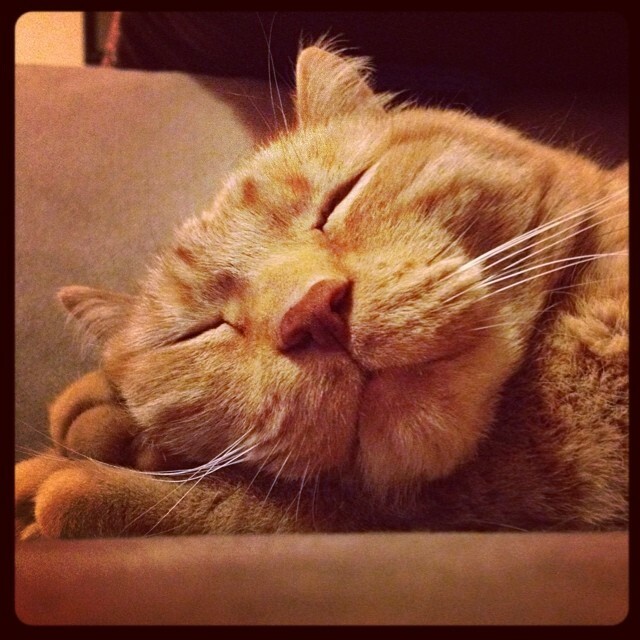 In case you haven't met Newton yet -- here's one of my favorite snapshots of him - he looks so happy sleeping! We will be choosing two lucky winners to win a $10 store credit for Newton's Nook Designs online shop! To enter, just leave comments on the Design Team Member and Guest blogs (see list below)! Two winners will be chosen at random from the collective blogs in the blog hop. Make sure to check out each of their blogs and comment for your chance to win. You will not know which blog has been chosen so the more you comment on the better your chances are of winning! You have until Sunday, December 7th at 9 pm CST to comment -- winners will be announced on the NND blog on Monday, December 8th. A hopping I will go. Love your stamps. Can't wait to get mine! They're on the way!! They are so cute.! So adorable! I love cats and this stamp set is just so much fun. This stamp set is so cute, and I'm cracking up b/c hubby put our tree up last night, & our kitten immediately decided it was a giant kitty toy and starting batting the limbs around. Your Newton is adorable :) I found my way here from Jennifer McGuire's blog, and am looking forward to seeing the rest of this hop. You did a great job with this awesome stamp set...LOVE IT! I love this, Jennifer! The embossing paste detail is fantastic! I love your stamp sets! I really love your cat too! What a sweetie! Newton is adorable! We have a "cat garden" cat we have named Tigger who looks much like Newton. After our last indoor kitty (had 4, over 30 years) we decided it was time to not have any indoor ones. But "someone" decided we aren't done with cats, as we found 4 feral newborns in our back yard. We made a family decision to care for them, have neutered 15 of them (the entire colony) and have named all of them. We continue to care for them, providing food, water and shelter when it gets cold. So yes, love cats and will definitely be checking out your stamps! Yet another card I like.... love Newton! Such a cute card....and kitty. Super cute card and that picture of Newton is just AH-DORABLE! He is just such a sweetie pie..I wonder if he knows just how famous and loved he is by all of us :) ♥. Now off to the blog hop, woohoo! Fabulous hop! Your little Newton is so adorable! I love this sweet card!! Love The cute cat on the card. What an adorable set. Love it. Such a cute cat! Love the layout as well. Thanks for sharing! great hop. fun to see all of the stamps in new settings. Great card! What a cute cat. Cute card. I like the sweater texture and I think Newton is being nice and decorating the tree. Cute card! Love that background stamp! Cute kitten card, but I love Newton's photo. My two are on top of me now and making it hard to type as they want attention. Awww...Newton is such a cutie -- I have a thing for orange tabbies (well, any tabby). His eponymous stamp is also adorable! I finisht the hop, and it was so inspiring, thanks for this amazing hop!!! and your card is so cute! I love Newton! I love your little kitten images, so sweet. Thanks for sharing how you made this card. Awesome card! Love your kitten! A great card! Love this adorable kitty. Such a sweet card. I may have another favorite stamp company. Love your tangled up kitty card, nice work! Awwww! So sweet!! Love your card it's so cute! Love your stamps! Ack! That cat is so cute! I just love the kitty images! I have a friend who has 5 cats and have been looking for an image for a special card. Thanks! Thanks for sharing your CUTE card and photo of Newton. So cute, I had a dog that played with the bells on our tree so we put them on the bottom just for him. I followed from Jennifer McGuire's blog, and am looking forward to seeing the rest of this hop. TFS. Our cats are naughty and nice too ;) But one of them likes to get in the tree and than just waits in the center until someone sees him. We're lucky to have plastic decorations, otherwise I think some of them wouldn't survive with him hanging around ;). Fantastic blog hop! So much inspiration and loved them all. Super cute card!! I've never heard of Newton's Nook, but found it from one of Jennifer McQuire's video! Going to hop along & take a look!! Awesome love this card and love the stamps. That picture od Newton is too cute. Thanks for sharing and this great hop. I finally had some time to do the hop! It was fun and fabulous as always! I so enjoy your stamps and the DT and guests showcased them beautifully! Thank you! Wonderful card...love the cute image and the embossing. I love the card and the NN stamps. These stamps are just adorable! Always a pleasure to see your work, Jennifer! Great picture of Newton! How adorable! Love this stamp set! Love the kitty stamp set..... and Newton! I love kitties......such a cute card. Darling stamps! Thank you for sharing. Jen! That card is beautiful! I must know where did you get the sweater pattern stencil!!! This is adorable--love the stenciling! Newton is so cute!! I love cat stamps and want to get my hands on some for Christmas!! Your cat looks like mine, and he's only good when he's sleeping! OH MY GOODNESS!!! i love your card!!! that sweater stencil...I WANT IT!! lol!! i tried to get a few different sweater patterend things (die cut plate - sold out, tim holtz stencil - sold out. ha ha! oh well!). i LOVE it with the silver paste, and newton in the tree - hysterical!! such a cute and wonderfully perfect image for any cat owner!! :) your card makes me so happy! !